Chocolate is big business. In 2012 the global candy and chocolate industry had estimated total sales of US$ 118 billion. Between 2007 and 2012 the annual growth in this industry was 2%, partially fuelled by increasing demand from China and India and this rate of growth is expected to continue. In 2012, the 10 largest global chocolate manufacturers, alone, had net sales of US$ 90,961 million, most of it relating to chocolate products. (Ref. Candy Industry 2013). Chocolate comes from one source only – cocoa, and cocoa comes from only one plant – the cacao tree. Yet this tree is presently living on the edge of calamity, constantly threatened environmentally by changing weather patterns and devastating fungal diseases. Prices rarely follow a reliable pattern, mainly because the success of each year’s global crop is heavily reliant, not only on environmental factors, but political, economic and social ones as well. 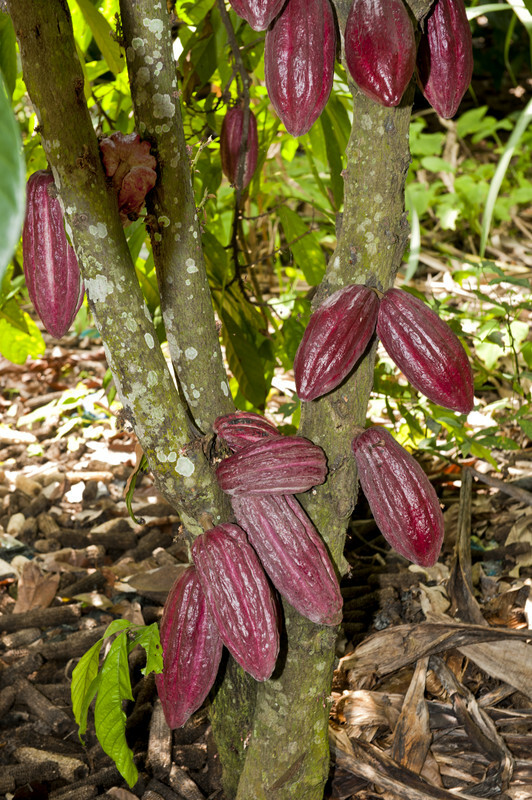 Cacao is a very fussy tree and will only grow in specific areas. Unfortunately, these areas have, in the past, been challenged by serious political and social tensions and any present stability is fragile.In addition, the developed world’s desire for inexpensive chocolate and other cocoa products has placed many people involved in growing cocoa on the poverty line. There is a real dichotomy between the prices paid to farmers and those stated on “Futures” Exchanges. Its not the objective of this article to highlight the plight of the cocoa grower, but ignoring the situation, or deliberately trying to obtain short term gains by keeping prices as low as possible, is probably as great a threat to the global cocoa supply as fungal epidemics. Cocoa beans have labour intensive and complicated harvesting, production and shipping needs. This article explains the challenges of shipping Cocoa beans and offers an introduction to some of the aspects that make Cocoa such an interesting commodity. In the early 19th Century the Cocoa tree was known as the Chocolate-nut Tree. There was such a plant as the Cocoa nut tree, but this was actually a reference to Coconuts. It was in the 18th Century that the Swedish botanist, Carolus Linnaeus, gave the Cocoa Tree the Latin name Theobroma Cacao. Theobroma is a two part word originating from Biblical Greek where “Theo” refers to ‘God’ and “broma” can be translated either as ‘that which is eaten’ or ‘food’. Hence the present translation of ‘Food of the Gods’. There is some dispute about the origin of the word Cacao, but it probably comes from the Yucatan Maya word Cacau. This is not surprising, since the Cocoa or Cacao Tree originates from the tropical jungles of South America, and even today grows around, between and over old Mayan ruins. Cocoa was revered by both the Mayans and the Aztecs. They regarded it as a source of divine ambrosia bestowed on them by their great god Quetzalcoatl. They used the larger seeds as currency and the smaller seeds to make a sacred beverage called Xocoatl, which was only allowed to be drunk by male priests and nobles. Archaeologists have found pots dating from 460-480 AD containing cocoa residue. Cocoa arrived in Europe courtesy of the Spanish Conquistadors who imported the beans from Mexico in the 16th Century. It was so popular that the Spaniards introduced the new tree and its precious beans to their other New World colonies and after a few decades (having managed to procure tree stocks) other colonial powers followed suit, establishing the crop in Indonesia, the Philippines, West Africa and Brazil. It was drunk as a bitter liquid, much praised for its medicinal benefits. In a 19th Century herbal entitled “Botany and Herbs” Cocoa is described as being “very nourishing and restorative.” Recent research into the health benefits of cocoa has shown that these opinions are now strongly backed by medical studies and this could open up new possibilities for this commodity. It was at the beginning of the 19th Century that the Dutch van Houten family developed mechanical and chemical procedures which established the mass production and consumption of chocolate. Originally the cocoa beans were finely ground up and then mixed with milk to create a chocolate drink. It was also possible to make biscuits, using sugar, cinnamon and vanilla, but the high fat content (the centre of the bean, known as the nib, contains an average of 54% cocoa butter – a natural fat) made the chocolate hard to digest. In 1828 Casparus van Houten patented a Hydraulic Press which pressed the fat from roasted cocoa beans, reducing the cocoa butter content by half. This created a cake which could be ground into cocoa powder, which became the basis of all chocolate products. This not only made chocolate drinks easier to make, but by combining the cocoa powder with sugar and re-mixing this mixture with the cocoa butter, created a solid mass (albeit with a bitter taste) which could be eaten. His son, Coenraad Johannes van Houten was a chemist who later developed a treatment of this cocoa mass with alkaline salts to remove the bitter taste and make the cocoa solids more water soluble. In 1879, Daniel Peter, a Swiss chocolate manufacturer, found that by adding condensed milk to the cocoa mixture produced a creamier texture and so milk chocolate was developed. It was these developments that provided the basis of the Global Candy and Chocolate manufacturing industry (consisting of chocolate products, soft and hard candy and gum) which today has such a massive market. Cacao trees appear to have originated in the lowland tropical rain forests of North East South America. They only grow successfully within a 15º latitude on either side of the equator and only below an altitude of 1000 feet. Cacao thrives in climates with high humidity and rainfall; prefers rich, organic, well-drained and moist deep soils; needs access to various species of insects for successful pollination and requires uniformly high temperatures with a mean of about 26ºC and at least 4 inches of rainfall per month. Dryer conditions can have a negative effect since Cacao trees are very sensitive to a number of fungi and diseases that thrive in dryer conditions and it is, itself, drought intolerant. Evolved as under-storey vegetation, the Cacao tree resembles an English Apple tree and grows to a height of 7.5 metres or 25 feet. It is shade tolerant and needs to be sheltered from direct sunlight and wind, particularly in early growth stages. This means that Cacao should be grown in association with taller shade trees. Cacao trees have broad dark leaves and masses of tiny pink and white flowers that grow in clusters straight out of the trunk and main branches of the tree. It is from these flowers that the pods develop, but only a small proportion (about 5%) of the flowers develop into fruit. Once a pod does develop, it takes about 5 months before it matures enough to be harvested. After planing, Cacao trees need about 5 years to mature enough to produce pods and about 10 years to achieve maximum production. Each pod contains a number of beans; the quantity varies depending on the type of Cacao and various environmental factors. Each bean contains a seed surrounded by a sugary type of coating, which when fermented produces the chocolate flavour. On average, each pod produces from 20-50 beans (it requires approximately 400 beans to produce 1 pound of chocolate). Droughts and soil erosion can lower yields considerably which is worrying since tree yields tend to be low anyway, with most trees only producing 20-30 pods per year in two harvests (4 pounds of cocoa beans per season). Cacao is an open pollinated (cross breeding) species. This causes difficulties when trying to improve such characteristics as bean quality and yield. Propagating from seeds has not been successful. The only way to produce trees of uniform high quality is by vegetative propagation resulting in exact clones of the parent tree. Bowers et al (2001) pointed out that plant diseases (as well as pest attacks) are major components in the decline of Cocoa bean production. Fungal diseases are particularly destructive and cause the greatest loss of production. Every year almost 40% of Cacao trees are destroyed because of disease. On a global scale, the greatest losses result from black pod rots, caused by Phytophthora spp, a fungus-like microorganism that is present worldwide. Between 30-90% of total infections annually are caused by this microorganism. One particular species P. megakarya, is spreading through West Africa. Since nearly 55% of the total global production comes from this area, this is a matter of some concern. Two basidiomycete fungal diseases, Frosty Pod Rot (Moniliophthora roreri) and Witches’ Broom (Crinipellis perniciosa) have also caused huge problems. Frosty Pod Rot, which destroys beans inside the pods and is transmitted by air-borne spores, has moved beyond Panama to Costa Rica and Nicaragua. In the 1980’s it is estimated that 73% of Costa Rica’s Cacao crop was destroyed by this fungus. In Brazil, the production of cocoa beans has dropped from 400,000 metric tonnes to 100,000 metric tonnes between 2001 and 2011, largely due to the spread of Witches’ Broom. Unfortunately this fungus has spread beyond Brazil to Peru, Ecuador, Venezuela, Colombia, Panama and the Caribbean Islands of Trinidad and Tobago. However, Witches’ Broom only has a real impact on trees grown in commercial plantations. Bowers et al (2001) have stated that the most sustainable way to provide a constant and reliable supply is to promote “production practices in which the small acreage farmer increases or maintains productivity at levels that are economically viable, ecologically sound and culturally acceptable, through the efficient management of resources.” Interestingly enough, 90% of cocoa production in the Cote d’Ivoire (the largest cocoa producing country at the moment) is farmed in this way. In addition, there are not many chemical ways to prevent the spread of these fungal diseases. One pesticide, Lindare, has a degree of effectiveness, but research has shown that its use is linked to the spread of Breast Cancer. Consequently it has been banned in a number of places, including the European Community. However, it is still used in a number of Cacao producing countries. It is perhaps not surprising, therefore, that although the organic cocoa market presently represents less than 0.5% of the total global production (c. 15,500 metric tonnes) according to Euromonitor International, the global sales of organic chocolate has increased from a value of US$ 171 million in 2002 to US$ 304 million in 2005 and experienced a 20% growth in 2011. Organic cacao is presently grown in Belize, Bolivia, Brazil, Costa Rica, Dominican Republic, El Salvador, Fiji, India, Madagascar, Mexico, Nicaragua, Panama, Peru, Sri Lanka, Tanzania, Uganda, Vanuatu and Venezuela. There are presently three main types of bean. Criollo beans come from soft red pods containing 20-30 white, ivory or very pale purple, large, roundish beans. They have a delicate, bitter, aromatic flavour and are easily processed (taking about 2-3 days to ferment) and so produce the highest quality cocoa, but this bean is very prone to disease and sensitive to climate changes. It is mainly grown in Venezuela, Ecuador, Sri Lanka and Indonesia. Forastero beans come from smooth yellow pods and are small, flattened on one side, varies in colour from dark reddish brown to violet and has a much sharper flavour. However, it also has a thicker skin and is hardier, but produces a lesser quality of cocoa and needs longer to ferment (5 days). 95% of the global cocoa output comes from this bean type. Trinitario is a hybrid of Criollo and Forastero (developed with the aim at avoiding the disadvantages of the other two). Trinitario is grown mainly in the Caribbean, but also in the Cameroon and Papua New Guinea. Beans are divided into three deliverable grades – A, B and C. A and B are deliverable at a premium; C is deliverable at par. Ripe pods need to be gathered every few weeks during the season because pods are only suitable for harvesting for 3-4 weeks, after which time the beans begin to germinate. This can be a challenging process because the pods don’t all ripen at the same time. The frequency of harvesting can have an effect on the yield so this needs to be done with care. The pods must also be cut with care from the trees, so not to damage nearby flowers and pods or the branches and the trunk of the tree itself. This is not easy since the pods grow on thick stems very close to the trunk and branches. If a flower cluster is damaged then no further flowers will develop from that spot in future years. If the tree is damaged this makes it easy for parasitic fungi to penetrate the tissue of the tree. The pods are best harvested manually by making a clean cut through the stalk with a well sharpened blade. The pods must be opened within 7-10 days after harvesting. If the beans are allowed to sit too long in the harvested pods then the pulp can dry out or uncontrolled fermentation can begin, leading to a poor end result with beans that are under-fermented or rotten. In which case the beans would look slimy and grey, rather than the white colour of freshly harvested beans or the bright orange brown of properly fermented beans. If the pods are opened in the planting areas, the discarded husks can be distributed through the fields to return nutrients to the soil. The pods must be split by hand. The best way of opening the pods is to use a wooden club, which, if it strikes the central area of the pod, causes it to split into two halves. It is then easy to remove the wet beans (covered in white pulp). It is possible to use a cutting tool such a a machete to split open the pod, but this can cause damage to the beans. Once the beans have been extracted from the pods they then need to undergo a two-part curing process of fermentation and drying. In order to moderate the initially bitter flavour and to develop the typical chocolate flavour, the beans must be subjected to a fermentation process during which the highly bitter tannins present in the beans are oxidised, resulting in the formation of aromatic substances and the development of the typical brown to deep red-brown colour of cocoa. The fermentation process beings with the growth of micro-organisms: in particular, yeasts grow on the white pulp. Insects, such as the Drosophila melanogaste or vinegar fly, are probably responsible for transferring the micro-organisms to the cocoa pulp. The yeasts convert the sugars in the pulp to ethanol. Bacteria oxides the ethanol to acetic acid and then to carbon dioxide and water, producing more heat and raising the temperature. The temperature usually rises to 40ºC – 45ºC during the first 48 hours of fermentation which essentially causes the bean to lose its ability to germinate. In the remaining days the bacterial activity continues under increasing aeration conditions as the pulp drains away and the temperature is maintained. As a result of the heat and the acetic acid produced as part of this process the cell walls in the beans break down and allow previously segregated substances to mix. This allows complex chemical changes to take place in the bean such as enzyme activity, oxidation and the breakdown into amino acids. It is these chemical reactions which cause the chocolate flavour and colours to develop. During fermentation the cocoa pulp clinging to the beans matures and turns into a liquid which needs to drains away from the bean. Whatever fermentation process is used, it does need to allow this drainage process to work. There are essentially two basic methods of fermentation – using heaps or “sweating” boxes. The heap method varies, but in West Africa the process usually used involved piling wet cocoa beans onto banana or plantain leaves spread out in a circle on the ground. The heap is covered with more leaves and left for 5-6 days, regularly turned to ensure even fermentation. Beans can also be heaped in layers in troughs, concrete pits or in fermenting tanks. In Nigeria, the cocoa is fermented in baskets lined and covered with leaves. In the West Indies, Latin America and Malaysia, strong wooden boxes with drainage holes or gaps in the slats at the bottom of the box, are used, allowing air and liquid to pass through. This process takes 6-8 days and the beans are mixed twice. Fully ripened and correctly fermented cocoa beans are therefore a brown to dark red-brown colour, have a dry weight of no less than 1gm, a loose and undamaged shell and have a readily crumbled and very fragile kernel with a pure, bitter flavour. Perfect beans must be undamaged and ungerminated, must include no foreign matter or mold and must not be infested with insects or have suffered wetting damage. They must not smell sour, musty or smoky. Poorly fermented cocoa beans tend to be purple in colour when under-fermented and very deep in colour when over-fermented. They also have a slaty to solid kernel and an astringent (mouth-puckering) flavour. The core may have changed to a yellowish white colour. If over-fermented, the beans will have a ham-like odour and if over-dried a smoky odour. The excessive heating which occurs in over-fermentation also results in butyric acid fermentation, which impairs quality. Once fermentation is complete, the wet mass of beans must be dried to reduce the moisture content from 60% to about 7.5%. It is rather important that the bean temperature during the drying process does not exceed 65ºC. The objectives of drying is to halt the fermentation process; reduce the water content in the beans; drive out the acetic acid which is formed during fermentation and to prevent the beans going mouldy. Drying must be carried out carefully to ensure that off-flavours are not developed. Drying should also take place slowly. If the beans are dried too quickly some of the chemical reactions started in the fermentation process are not allowed to complete their work and the beans become acidic with a bitter flavour. If the drying is too slow, then moulds and off-flavours can develop. The beans can either be dried spread on mats in the sun, which takes 1-2 weeks, with the beans being turned 4 times a day and at night being put in sacks and placed under cover. or by using special drying equipment. In 2012 about 70% of the total global output of Cocoa came from West Africa, with Cote d’Ivoire being the largest producer (40%), followed by Ghana (15%), Sierra Leone (10%) and Nigeria (5%). The other major producers are Indonesia (14%) and Brazil (4%) with smaller quantities coming from Cameroon, Ecuador, Colombia, Venezuela and Malaysia. The potential impact of civil unrest in these key cocoa producing nations can have a dramatic effect on the price of futures contracts and usually controls short term price movements. Political, social and labour issues also regularly threaten to decrease or disrupt supplies of cocoa. On a long term basis, any improvement in work and labour standards (particularly in Africa), could also influence cocoa commodity prices, especially since production costs are presently low. World cocoa prices are also influenced by the link between stocks at crop year end and global cocoa grindings. So, if the supply in down, this leads to a fall in stocks to grind ratios, which leads to increased global cocoa prices. There is a massive demand for cocoa beans and this is reflected in the global production figures. In the last 30 years there has been an 130% increase in yields and recently cocoa futures hit a 23 year high. In 2004 production reached a record high of over 3.6 million metric tonnes. In 1991 the global production was 2.2 million metric tonnes. Most countries production has increased. There are exceptions. Brazil is still recovering from the impact of the Witches’ Broom fungus. However, even without such wide-scale problems, the harvests can go down as well as up year on year. Reuters announced recently, for example, that the cocoa arrivals in the ports of the Cote d’Ivoire had reached 1,079,000 tonnes by 28th April 2013 since the start of the harvesting season in October. This is compared to 1,089,000 in the same period the previous season. (Please note that the Cocoa year runs from October to September). The Quarterly Bulletin of Cocoa Statistics (most recent figures from the middle of May 2013) shows that the global production in 2011-2012 was 4,078,000 metric tonnes. They forecast production figures of 3,967,000 metric tonnes for 2012-2013 (a decrease of 2.7%). The increase in supply has not had a detrimental effect on market prices: in fact, the exact opposite. In 1992 the price per metric tonne was US$ 1,800. In 2008 the price had risen to US$ 2,600 per metric tonne. Historically from 1959 to 2013 Cocoa has averaged US$ 1,553 per metric tonne. The record low was in July 1965 (US$ 211/tonne) and the record high in July 1977 (US$ 5368/tonne). Unfortunately, this increase in price is not reflected in the price paid to the farmers. Peter Robbins points out that in the 22 year period from 1980 to 2002 the price paid to farmers fell dramatically, from US$ 2,832/tonne to US$ 1,190/tonne in 2002. This is mainly due to over supply, something that tropical commodity markets are particularly sensitive to. Unfortunately, as Robbins points out “Individual farmers are likely to respond to the suggestion that they should reduce production capacity as just another ‘trick’ from the outside world which will impoverish them further.” And this is yet another real threat to cocoa supplies that the farmers themselves will become so impoverished (many sit on that threshold today) that they can no longer afford to grow and supply cocoa. Or, in the case of Latin America, the fall in income of commodities such as coffee and cocoa has had the effect of boosting Latin American cocaine production. Cocoa is mainly consumed in Europe (the biggest consumers being Germany 9.1%, France 7.2%, UK 6.8%), North America (13%), Japan and Singapore. Europe mainly imports from Africa (with Amsterdam being the main port of entry – more than 1,320,000,000 pounds of cocoa, 1/6th of total global production ships through Amsterdam each year), the US from Latin America and Asia from Indonesia. The main industries involved in cocoa trading are producers of chocolate, chocolate-related products and colouring agents for food products. Chocolate is made by processing cocoa powder and most larger traders of cocoa (Archer-Daniels-Midland Company) do this themselves. They then sell the processed material to confectioners. Cocoa is also used in the beauty products industry as an ingredient in the manufacture of various lotions and creams. But there is now growing evidence that Cocoa seeds have some interesting nutrition and medical properties. Crozier et al have described “Cacao seeds .. as a ‘Super Fruit’ providing nutritive value beyond that of the macronutrient composition.” Cocoa beans are also one of the best food sources of Magnesium (necessary for good heart and blood pressure health) and also serotonin, dopamine and phenylethylamine (all of which are neurotransmitters which help to alleviate depression). Cocoa contains monoamine oxidase (MAO) inhibitors, which allow serotonin and dopamine to remain in the bloodstream longer without being broken down. Antioxidants found in cocoa beans are highly stable and easily available to human metabolism. Antioxidants can help to neutralise free radicals and keep these from damaging the DNA and mitochondria of the body’s cells, something which has been identified as a significant aspect of many degenerative diseases. Cocoa is one of the richest sources of antioxidants in any food. One standard for testing and measuring antioxidant effectiveness of various foods is known as the ORAC Score. The higher the score, the higher the concentration of antioxidants. Research from the US Department of Agriculture/Journal of the American Chemical Society indicates that Dark Chocolate has an ORAC Score of 13120, compared to Prunes at 5770, Blueberries at 2400 and Raspberries at 1220. In 2003, Cornell University (Lee et al) published an article where they stated that “Cocoa has more phenolic phytochemicals and a higher Antioxidant capacity than Teas and Red Wine.” Phenolic phytochemicals or flavonoids are believed to inhibit the cytopathic effects of HIV in cell culture (Unten et al 1991) by inhibiting absorption of the virus rather than limiting its replication once it is absorbed. In addition, some interesting research is now being done on Epicatechin which is a flavonoid compound found in unprocessed cocoa seeds. This is usually removed from commercial cocoa because it has a bitter taste and is an exciting development because it could increase the value of cocoa without actually impinging on seed yields. Epicatechin is a strong antioxidant which has insulin mimic actions and could improve heart health. A small clinical trail (Tamb et al, 2012) at the UC San Diego School of Medicine (in association with the VA San Diego Healthcare System) found that patients with advanced heart failure and type 2 diabetes showed improved mitochondrial structure after 3 months of treatment with Epicatechin-enriched cocoa that helped them with their exercise capacity. Another study (Shah et al 2010) believes that Epicatechin may protect the brain after a stroke by increasing cellular signals already known to shield certain brain cells from damage. It is perhaps ironic that the removal of epicatechin from the cocoa mass (originally discovered by Coenraad J van Houten in the 19th Century) which paved the way to making chocolate such a multi-million dollar industry in the first place, and hence encouraging the mass growing of cacao trees, is now going back full circle to re-introducing the bitter flavonoids for health reasons. Trading in commodities can be expensive and complicated and it is one thing to deal with futures or the buying of future stocks and selling them through specialised trading markets; it is quite another thing to be involved with the physical selling and transporting of the commodity in question from producer to manufacturer. A great deal of money can be made with both of these business activities: a huge amount of money can be lost with both of these business activities. The structure of the supply chain for Cocoa beans can differ, not only between countries, but within them as well. Some marketing channels between farmers and exporters can involve at least two types of middlemen, such as small traders and wholesalers. Some marketing channels offer a direct link from the farmer (through cooperatives) to the exporter. In order to ensure that this supply (through whichever type of channel) is made with the smallest number of risks, it is a good idea to ensure that best known practices are applied. The following information comes from research completed by Dr Jean-Marc Anga. He argues that all producers should aim for producing high physical quality cocoa beans, with records showing full traceability of all activities; meet international food safety requirements and that Cocoa should be produced and used in accordance with economic, social and environment requirements that promote sustainable cocoa supplies. – Where applicable, apply recommended pesticides carefully, at appropriate dosage, period and time, using the appropriate equipment. – Containers should be clean, free from residue of previous cargoes and well ventilated. Comprehensive record keeping systems in which all essential elements of cocoa production are captured. Cocoa beans should be shipped shortly after harvesting (preferably within a 6 month window) otherwise losses could occur because of the high humidity in the tropics. Due to the high value of the cargo, new or high quality sacks of jute or sisal should be used, usually packed to a gross weight of not more than 60-65 kgs. (Please note that if the sacks are slack, this is due to them not having the full amount of beans in the first place. Although cocoa does give off moisture during shipment, the shrinkage is usually 1%, although this can rise to 3%. But it will not cause the sacks to slacken). Also the sacks must not be allowed to get wet before packing, because they can rot and break under the pressure and weight of the packed beans. In addition, the water content of the jute sacks themselves must never exceed 9% because otherwise this can lead to increased relative moisture. Cocoa beans require particular temperature, humidity/moisture and ventilation conditions because characteristically they have a propensity to develop condensation and reabsorb moisture during shipment. Due to its high fat content (39%-60%), cocoa has a tendency to self-heating and there may even be a risk of a cargo fire on contact with flammable substances. If the cocoa is subjected to temperatures that exceed 25ºC then elevated fat contents and moisture can result in hydrolytic/enzymatic fat cleavage and self-heating of the beans, so rancidity, over-fermentation and even fungal infestations by Aspergilius Fumigatus can occur, even if the cargo does not self combust. Under certain conditions which include temperatures exceeding 25ºC, high relative humidity and a lack of oxygen, mesophilic microorganisms can develop and multiply in wet spots, raising the temperature to 37ºC. At this point thermophilic microorganisms develop which raise the temperature to 70ºC. This leads to an exothermic chemical breakdown reaction, in particular by oxidation reactions between unsaturated fatty acids and atmospheric oxygen. This in turn leads to pyrophoric carbon and gases forming which raises the temperature even higher and the beans then start to smoulder. Therefore, keeping cocoa beans cool is a major consideration. For the same reason as above it is really important to ensure that containers containing cocoa beans are not allowed to stand exposed to sunlight for long periods of time, either at the loading or discharge ports. Neither should containers be covered in plastic covers at any point, since this can result in severe sweating. Cocoa beans are highly hygroscopic and so do not react well to any additional moisture. Generally speaking the break-bulk method of shipment is found to respond best to the need to control temperatures and humidity, particularly during the October-April season. However, there are circumstances when containers are used, although any use of containers must be agreed in writing prior to shipment with all buyers first. There are three types of container shipment that can be used. Ventilated containers, also known as passive ventilated, or coffee containers are sometimes used, but any container used must meet compliance limits for cocoa shipments. The ventilation is provided by ventilation openings in the top and bottom side rails. They are designed to stop spray entering the container. The compliance limits include ensuring that the floors of the container are wooden and this wooden flooring must be absolutely clean and dry. If it has been recently washed, then it must have dried completely prior to use. The water content of the wood in the containers should be 12% or less, corresponding to a timber equilibrium moisture content of 70%. This is to ensure that the flooring does not constitute an additional source of water vapour to dampen the cocoa cargo. Insect infection can be a major problem and usually occurs in cocoa that has been stored for some time. Typical pests are cocoa and meal moths together with ants and cockroaches which can eat and contaminate the cargo. If there is any concern about live infestation, the container should be fumigated with Phostoxin (for example) before the cargo is loaded and a fumigation certificate obtained. Some fumigants may be disallowed in the country of import, so it is important that this is checked prior to allowing any containers to be fumigated with banned products. In addition, on board pest control using fumigation tablets can result in dust deposits on sacks. This dust contains residues of the poison, which can be highly hazardous to humans. Strict controls should be maintained. The sacks of beans should be loaded such that they fit well within the container, but allow air to circulate and the sacks must not be allowed to touch any metal parts of the container, since condensation is much heavier on or around metal. If the cargo is being shipped to colder climates where freezing temperatures are a problem, then avoiding metal is of even greater importance, since the bags can freeze to the metal, leading to bags breaking and spillage when the containers arrive at their destination. There must also be sufficient air space between the top layer of the bags and the containers’ overhead bulkhead. 20′ containers should be limited to a maximum weight load of 18 metric tonnes. 40′ containers should not be used, but if they are the weight load must not exceed 26.25 metric tonnes. The bags may be covered with paper which acts to absorb any moisture and to provide protection from moisture damage. In addition a two-layer anti-condensation film should also be used to provide protection against dripping sweat. Cocoa beans must not, under any circumstance, be stowed in a container together with oily products which can add fuel to any overheating condition, or with moisture releasing goods such as copra, bran or rafted logs. A less expensive way of shipping cocoa beans in containers is to load them onto flat rack containers which are then placed in ventilated holds. This is a more cost effective shipping method than ventilated containers. Flat rack containers consist of a floor structure with a high loading capacity composed of a steel frame and softwood floor and two end walls. These end walls are stable enough to allow cargo securing means to be attached and several flat racks to be stacked on top of each other. Cocoa beans can also be shipped in standard containers, using big bags or liner bags, but this should be avoided unless there is no other way possible at the time to ship the cargo. If non-ventilated containers are used then it is essential that Kraft linings and coverings are used. In addition, these containers should be sealed with an ‘expansion seal’ – a device which maintains the integrity of the original seal, but allows the opening of the container tail gate sufficiently widely to allow ventilation during transit. All types of container must be stored below deck away from sources of heat and major variations of temperature. Too hot or too cold temperatures can ruin the cargo. It is really important that consideration is given to the temperature variations that the vessel may sail into, both during the voyage and at the unloading destination. Severe cooling at nigh may result in container sweat if the temperature dips below the dew point. During hotter parts of the year, the temperature drop between the ports of loading and unloading may be 15ºC-20ºC. In colder season, however, the difference may be 30ºC or more. Incoming colder air may cause sudden drops in temperature which, especially in container interiors, may result in a considerable increase in relative humidity. In this situation, the water content of the cargo is particularly important. Rapid and major cooling from the outside may readily increase relative humidity to 100%, resulting in condensation and wetting, vapour and mould damage to the beans. Consequently, containers must be unloaded as quickly as possible in the port of destination since the danger of excessive condensation is greatest after the containers have been discharged and are waiting to be unloaded. On arrival at the discharge port the water content of the cocoa beans should be just above 6%; a higher intrinsic moisture content would export the cocoa to excessive risk in subsequent storage. If the cocoa beans are shipped as break bulk cargo (i.e. in bags loaded into a hold, which must always be ventilated) then the loading procedure must be undertaken with care, especially with regards to the use of hooks. Specialised hooks such as plate or bag hooks should be used since normal ones can subject the cargo to point loads which can result in damaged bags. Since cocoa beans are highly hygroscopic they will release large amounts of vapour during transport. The water content of the beans can fall by 1%-3% during long journeys. Improperly fermented and dried cocoa beans have a greater tendency to release water vapour. Moisture loss from the cargo can cause condensation to form if the ventilation is not adequate. However, this procedure must be carefully monitored because too much water loss can also be damaging. If the water content of the beans is less than 6% then they can become brittle. If the water content is more than 8% then this will cause damage, which if allowed to spread will lead to complete loss of the cargo due to rot. Maintaining the correct moisture content, therefore, is extremely important. Essentially there are two types of moisture damage that can occur – sweat damage and vapour damage. Sweat damage is caused by the formation of ships sweat below deck, especially at night when the surrounding atmosphere and outer walls of the hold cool down. If the upper layer of bags in the hold are not adequately covered, the drops from above will not be absorbed by intervening layers and so the damp will penetrate the sacks containing the cocoa beans. This is easily identifiable since there will be spots on the bag fabric caused by the drops of water. 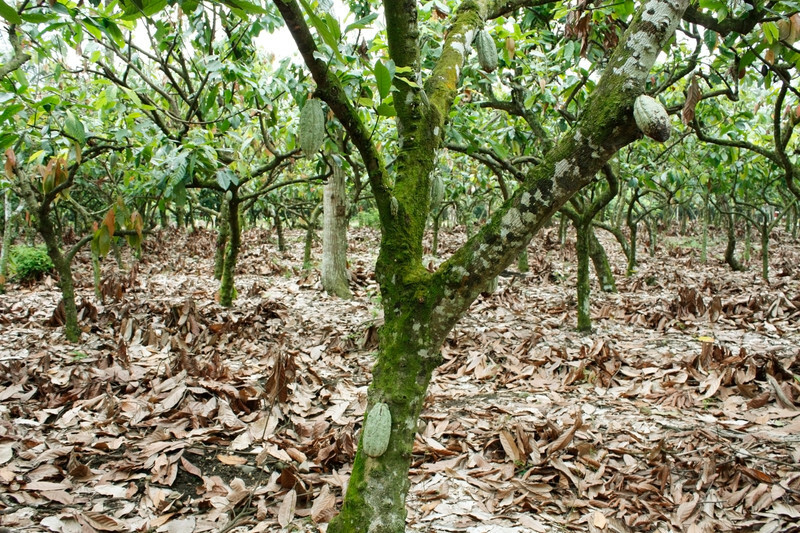 Under these spots, there are usually found clusters of cocoa beans covered with white mould and stuck together. A few sacks can end up being damaged through sweat. Vapour damage, on the other hand, could cause damage to whole sections of the cargo. Vapour damage is caused by excessive relative humidity in the hold. It can cause cocoa beans to develop a thin covering of mould which can affect, in the worst case, the entire contents of the hold. Mould is a serious problem with cocoa bean shipments. There are 8 mould species which between them can produce foul-smelling substances and can cause the cocoa beans to decompose. Some species participate in self heating while others may form strong toxins. Mould occurs when the critical water content exceeds 8.5% and develops within 3-4 days, causing spores to form on the surface of the beans. It is possible to check the number of spores per gram and this is one of the measures done to calculate the quality of the cocoa beans being supplied. There are four different categories. Category 1 has 100-1000 spores/gramme and is high quality and deemed suitable for human use. Category 2 has 1000-10,000 spores/gramme and is low quality but deemed OK for human use. Category 3 has between 10,000-100,000 spores/gramme and is low quality. There is uncertainty on whether these beans can be used, but this is dependent on the number of spores. Category 4 has 100,000 plus spores/gramme and this is very low quality and completely unsuitable for human use. The cocoa beans must also avoid contamination from salt water, which is particularly harmful since salt has the effect of increasing the hygroscopicity of the beans. Cocoa beans also contain enzymes which can bring about post-fermentation which is triggered if the beans are not exposed to circulating air. The recommended ventilation is for air exchange rate to be 10-20 changes/hour with the objective of ensuring that any water vapour is removed from the cargo. The ventilation in the hold must be arranged so the air is blown in from beneath and rises upwards, continuously removing warm, moist air. Any covers used must be arranged to allow the air to circulate freely and ventilation channels and wells need to be arranged in the stow. Cocoa beans have a strong odour and can taint other cargoes such as raw coffee, so cocoa and coffee should not be shipped together. Cocoa beans are also very odour-sensitive, and can in turn be tainted by commodities such as copra, bran, pepper and palm kernels. They can also be tainted by any smells that are left in containers and holds from previous shipments, so these need to be checked for any odours prior to loading. Cocoa beans don’t cause any contamination, but are sensitive to contamination by dust, dirt, fats and oils. Raw cocoa is particularly sensitive to cement and coal dust. Cement dust in particular passes straight through sacks into the beans, and can cause major losses. 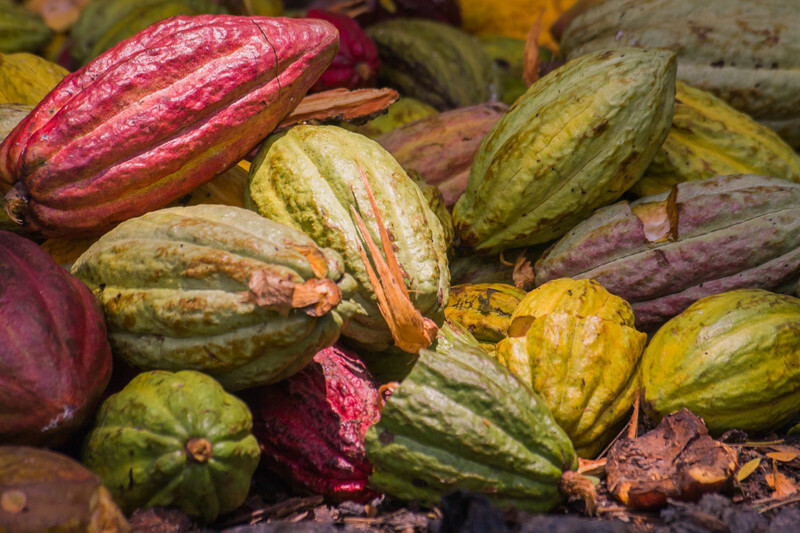 The trade in raw cocoa is vital for a number of very large organisations. Any threat, be it ecological, economical, social or political, can cause a set-back. A combination of some or all these threats could cause huge problems. Any organisation to whom their cocoa supply is a major factor should be aware of this and reacting accordingly. One company that does is Hotel Chocolate, who are one of the few chocolate makers to actually grow cocoa which, in their case, comes from their Rabot Estate in St Lucia. They run an Engaged Ethics programme both in St Lucia and Ghana and not only have they been highly successful in obtaining high quality stocks to guarantee their supply chain, but have dramatically improved the lives of cocoa farmers in both countries. In St Lucia they guarantee to buy all cocoa that farmers in the programme wish to sell. They pay 30%-40% above world market prices and pay within a week. They also buy cocoa wet, which means unfermented so the farmers can concentrate on the growing side. They give advice and technical support to farmers and have a Chocolate factory on the Rabot Estate where some of the added-on benefits of chocolate making stay in St Lucia and give work to the locals. In Ghana they found that cocoa farmers had a series of problems. Many had cocoa trees that were too old, so yields were decreasing year on year. There was the constant problem of disease. It was possible to buy seedlings from a research centre, but this involved a long and expensive trip to the centre together with a bumpy ride home which often destroyed the fragile seedlings. So Hotel Chocolate set up a seedlings nursery in Osuben village and raised hundreds of thousands of cocoa seedlings which they sold at a subsidised price to farmers in the local community. Other farmers soon joined in and there are now 10 satelite nurseries raising more than 100,000 seedlings per year across 2 different regions in Ghana. Most are now virtually self funding and more than 100 families have benefited from greater crop coverage and improved yield. Chocolate is big business, but it requires specialised knowledge and experience to grow cocoa without major problems and ship without loss. And as a commodity, it is a very risky business indeed. Stephen J Crozier, Amy G. Preston, W. Jeffrey Hurst, Mark J Payne, Julie Mann, Larry Hainly and Debra L Miller “Cacao seeds are a ‘Super Fruit’: A comparative analysis of various fruit powders and products” Chemistry Central Journal 2011; 5:5DOI:10.1186/1752-153X-5-5.